The thrilling conclusion to The Skylark Trilogy: Revolution is brewing in the city within the Wall. The city stands divided, and war is imminent. The rebels need a leader. After months beyond the Wall, Lark returns with Owen by her side, prepared to overthrow the Institute once and for all. But Lark's triumphant homecoming is short-lived when another leader emerges to unite the rebels: Eve, a mysterious Renewable. Lark wonders if Eve's powers will bring them strength?or bring humanity's final downfall. If you’re a fan of�These Broken Stars and�This Shattered World and are not quite sure what to read next, I think that you should give Meagan Spooner’s vastly underrated Skylark trilogy a chance. Spooner’s trilogy published by Lerner Publishing Group blends fantasy and science fiction to create a world that’s unique. This series is interesting with a compelling main character. However, to be completely honest, I think that�Lark Ascending, the last book in the series, is probably the weakest. Note, spoilers for the previous two books are happening after this paragraph. 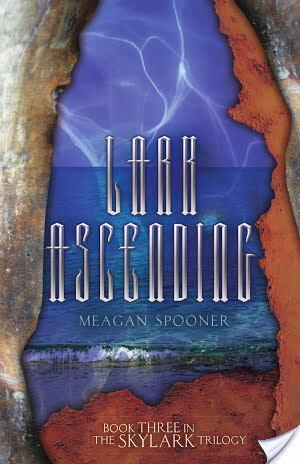 Lark Ascending brings readers back to where the Skylark trilogy started. Lark has returned home, only to discover that is complete chaos. There are rebels who are fighting the architects and the institute. Lark is concerned that the world will end. Meanwhile, the renewable known as Eve has been freed from the Institute by the rebels. She is being hailed as a hero and as a savior, however, Lark does not trust her. And so, this entire book revolves around the conflict between the rebels and the Institute and how exactly they are going to save the world and prevent everyone from becoming shadows. Also, there is more Oren in this book. As you all know, I am totally partial to Oren. Lark is compelling because she’s one of those hero characters who does not have all the answers. She kind of struggles against being the hero, but in the end she knows that she needs to do whatever it takes to save her people. I liked her devotion to Oren and her friendship with Kris, the architect turned rebel and Nyx, the pixie machine. I liked that in this book Lark really has to show courage and heart. She has to face her fears as well as death. It’s really actually cool to see. She also has to deal with the changing nature of her relationship with Oren. To be fair, I think that maybe the reason I don’t love this book like I do the others in the series is that there is not as much focus on Lark’s romance with Oren. You guys know I am all about the swoons and there really aren’t much of those with this book. Rather, it’s more about the world building and the focus is on magic and the Resource. It’s about why the world is the way that it is and why people become shadows and aren’t born as Renewables at the Institute. There’s exploration of Eve’s madness and her connection with Lark. We see that they are two sides of the same coin. We see how Eve’s imprisonment has broken her mind. We also ultimately see redemption and healing. The Skylark trilogy is worth reading if you are interested in books that blend science and magic. There are points where the world building gets a little confusing. Sometimes the series drags a little bit, as well. However, overall, I really liked this books and hope they do find more traction within the YA community, especially after the success of�These Broken Stars. Man, I’m disappointed. I’m glad you liked this one, but I’m not sure if I’m going to bother. I liked the first book a lot, but I already didn’t have enough swoons in book two, so it went a bit slow, and I’ll have bigger problems here. *sighs sadly* The world building is super boss though.